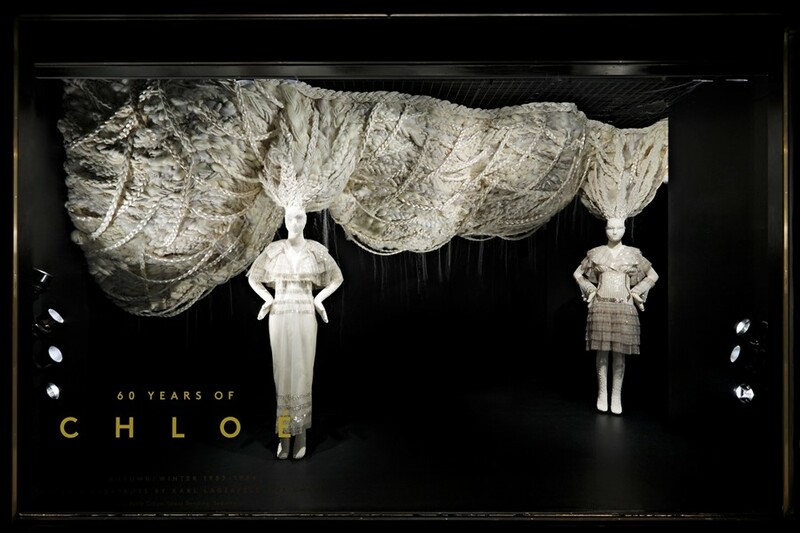 "All the designs for the Chloé anniversary windows at Barneys that I came up with started with the dresses. There’s a dress with a guitar, so we took musical instruments to a whole new level of phantasmagoria. We have literally thousands of instruments, and we wanted to make an overwhelming state of visuality. As you can see, in each window, we took [the dresses] to a new level. All the colors in the shawl and skirt—multitudes of color and geometry—was my inspiration. I’ve worked for many years for Chloé on all kinds of levels – for the campaign, with the show, things like that. When I proposed all my concepts and ideas they were over the moon. I view hair as a fabric. I don’t differentiate between the fabric of steel, clothing, or hair. Chloé is always about a very wonderful free-spirited girl, not very traditional, not too young. It’s something for a very sophisticated mind. Dennis Freedman who I’ve worked with for many many years, was an absolute genius to have the insight to have someone like me design the windows, and not only as a hairdresser. People say, ‘Oh, he did the hair for the windows,’ but when you come and see the windows there’s much more to it than the actual fabric of hair. I think it was a great collaboration for all of us. Dennis understood very clearly that I view this not as a window, but as an installation. [We] translated hair into something that has nothing to do with hair. It’s always my starting and inspiration point to create something explosive and interesting, and something for people to stop and stare and look at. Hair is probably the first stroke of art ever in history. It’s original adornment, original art. When someone caressed or arranged hair to design something on themselves, to make themselves feel individual. [The final product] is fantastic. First and foremost, I could never do a herculean task without an incredible team. It’s a singular vision, but it’s a team effort. It’s a lot to live up to after my success last year with Gaga, which was super fantastic, but I think we’ve actually done quite great."